Entertainers Dream !!! 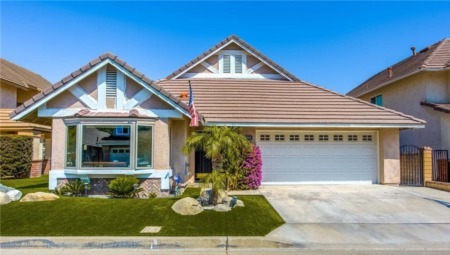 This beautiful 5 bedroom 4 bathroom custom pool home In North Tustin situated in a very private community has something for everyone . Incredible views and a outdoor BBQ deck with granite counter tops and dining island great for parties and entertaining guests and family. Two of the 5 bedrooms and the dining room have custom french doors with retractable screens and terrace style balconies great for morning coffee or relaxing with a glass of wine and your favorite book. The master bedroom with master bath overlooks the pool and casita. Pool side is a one bedroom casita with kitchenette ,bathroom and walk in closet with its own private entrance, great for in laws, guests or extra income ,was rented for $1250 a month. The sunken family room also has views, a balcony with access to to casita and the master bedroom it overlooks the a pool and has a cozy fireplace. The focal point besides the views is the heated pool with spa located with the house wrapping around it. Hardwood type flooring and Travertine tile throughout. The lot is 19800 square feet loaded with trees for privacy but could be used for an incredible garden . The neighborhood has custom homes all over ranging from 1.2 m to a 2.5 acre nearly 5 million dollar property. The property has many exotic plants and an orange tree loaded with fresh oranges. This is a must see property and a great opportunity with fantastic schools. Lot Size: 0.45 Acres / 19800 Sq. Ft. Directions:Fairhaven and Panorama Place / left on Panorama Crest/ Left on Panorama View. SchoolsClick map icons below to view information for schools near 12751 Panorama View North Tustin, CA 92705. Listing provided courtesy of Jeffrey Wermuth, First Team Real Estate.